Successfully Added Digital Voice Recorder with Telephone Connection to your Shopping Cart. Digital Voice Recorder with Internal and External Microphones and telephone connection, you'll never miss another note or appointment with this great gadget- record memos, speeches, presentations or even telephone conversations in crystal clear WAV or ACT format. With an amazing 2GB of flash memory built in you'll be getting up to 500 hrs of recording time! 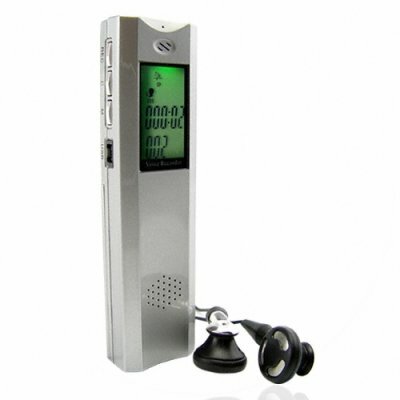 By using the included telephone attachment you can record conversations with others or monitor someones phone. There are 3 different quality recording modes available. This handy little recorder can also work as a typical MP3 player so after the boring lecture you can walk home to your favorite tunes. Available right now from Chinavasion.